Police in India say they have asked two members of a trust linked to guru Sri Sathya Sai Baba to explain the source of a large amount of cash. They say they recovered 3.5m rupees ($80,000) from a car in the southern state of Andhra Pradesh on 19 June. Police say the trustees have been given three days to respond to their request. One of the trustees has told the BBC the money was donated by "alumni" of Sai Baba's educational institutions. Sai Baba died in April, aged 84. He said it was in order to build a tomb in memory of him. In a separate development, Sai Baba's Sathya Sai Central Trust said it had recovered a large quantity of money and cash from his "personal chamber". "About $2.5m of cash, 98kg of gold and 307Kg of silver were recovered and deposited in the bank account of the central trust," a statement released by the trust said. Followers of Sai Baba believe he had magical abilities to produce objects out of thin air, visit people in their dreams, perform miracles and cure terminal illnesses. But his critics say that many of these activities were publicity stunts. They say that he was a persuasive fraudster who used his huge popularity to avoid being investigated over allegations of murky financial practices and sexual abuse. These charges were always strenuously denied by the guru and his huge number of followers and were never proved. 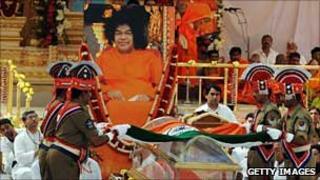 Police officials have asked trustees RJ Ratnakar - who performed the last rites of Sai Baba - and Madras-based industrialist V Srinivasan to explain where the money came from. Mr Srinivasan confirmed to the BBC Tamil service he had received the police notices. "Notices, not summons, have been received today from the Inspector of Police for a statement in connection with a case registered by the police against certain persons," he said in an e-mail. He said the recovered cash was part of a much larger sum that will be spent on the construction of the tomb. "This is just an advance," Mr Srinivasan said. "The money was intercepted when it was being transported to the Bangalore-based contractor." He added that he would "wholeheartedly welcome" any police investigation and indicated his willingness to co-operate with the concerned agencies.